History – Herkimer Diamonds were first found at Herkimer, New York USA and they get their name due the the location. Herkimer Crystals are not real diamonds but are a variety of double terminated quartz. 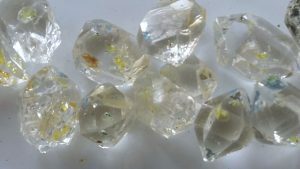 Herkimer Diamond is known as an ascension stone as they have a high vibrational level and this allows you to move to into the highest possible vibration while still being in your own body. As Herkimer Diamonds are a Clear Quartz they are a very powerful amplifier of other stones. Due to the higher vibration of these stones they can help you to connect with higher realm including your guides and masters. Herkimer Diamonds help us to move on and release any blockages that we might have on a deeper level. An aid in mediation that are specifically for astral projection. Healing – Master healer, immune system, brings balance to the whole person, aligns the subtle bodies. Program a Herkimer Diamond by either doing positive affirmations or meditating you intent on it. This is particularly effective when do with clusters as they will send out the programmed vibration in all directions that the crystals point. Program your herkimer Diamond to send out the healing energy that you need it to, then keep it on or around you all the time. Jewelry made from Herkimer Diamond is an extremely useful piece to have on and wear. Healing with Herkimer Diamond is very powerful and should be in every healer/stone owners kit of stones. This can be further fine tuned by using the formation within the crystal as well please see here for different crystal formations.